First of all, a little apologize for breaking the flow of the blogs, I have begun a new project with a couple of friends, we are making some handmade notebooks with some of our illustrations and we have been giving to them our total and complete attention on these days, which is actually quite cool and this weekend we are going to be making a mural in a little Kung Fu Dojo that is located outside of the city, therefore I will be out for a couple of days, but anyway, I wanted to, you know, catch up and get things up to the day and share a little bit the process that I have been going through throughout these days. I believe a complete and socially valuable code of ethics can be developed based (entirely) on the principle of empathy. I believe the universe becomes more fascinating and awe-inspiring the more closely and carefully it is examined. I believe my needs are not as important as other peoples. so what comes through within these beliefs is that point of 'giving up yourself' for others. suppressing yourself and your wants/needs for others. So while these beliefs may at first glance appear to be 'positive' and benevolent, the reality of it is that they are how you justify your self-suppression to yourself. so they're part of how you suppress the fact that you actually just are afraid of facing conflict and anger and that's why you live according to these beliefs and those morals. in a way making you feel good about suppressing yourself so you wouldn't have to see and realize the extent to which you are in fact suppressing yourself. so that would then also be why you have such a hard time 'letting go', because that self-suppression is not something you want to see or face within yourself. So what tested out specifically in terms of those feelings is that it's a personality that's triggered whenever you see the 'shape' of your ex, and its actually a personality that´s also triggered in relation to your mother, and more specifically its triggered in relation to 'imagination' in your mind about how they see/perceive you. so the personality wherein you feel 'valuable, appreciated, encouraged, comforted, energized' is based on a point of imagination in your mind wherein you perceive and want them to see you as they've given you different feedback then that would just confirm to you that it was all your imagination, then perhaps your mother tested out as a more subconscious point, something you are wanting/looking for from her and have instead lived out with your girlfriend. which is how relationships generally go. So, basically in a nutshell, this positively charged personality wherein you feel 'valuable, appreciated, encouraged, comforted, energized', is a reaction to the other personality thats based on the fear of conflict/anger which you suppress by living according to morals. and the reaction every time you see your ex is due to the suppression of that deeper personality, the resistance to face and experience the fears that its based on. so I would suggest as a solution you can apply in those moments when you see your ex and that reaction comes up - to use that reaction as your 'cue' to become aware that the reaction is really about something else and for you to look at what inside of yourself you are suppressing, so that moment of reaction can then be an opportunity for you to start investigating and opening up this whole mind-pattern, by realizing that its not so much about 'wanting her' as it is about you trying to get away from something inside yourself. Now what I tested out is pretty much the whole design of it, which exists on multiple levels of your mind. So to actually walk through it and change it will take you some time and you will do it step by step and layer by layer." Continuing with the blog that I wrote on the day 1014. In the last blog I took a look at the word "Talent", today I would like to have a look at the word "Intelligence" and how I have created my relationship towards it in relation to the point of attraction. When this experience of attraction emerged towards my partner, one of the things that got me very attracted towards her, was that "appreciation and appreciation" of the ideas that I would present to her in several moments, to which I could notice that she would react in like an expectant way for hearing more about what I was saying. And basically, she would say things like "Oh, you are very smart, I like your way of telling and saying things". Within that, I can also see this relation to the desire of feeling accepted and appreciated. I can notice that I would actually become very much attracted by the idea of being able to speak with her about several subjects, but actually, and as I am writting this, I can also see that it would be, very much in part due to my desire of wanting to receive that "appreciation" by being called "smart or intelligent" and things like that , lol. And I must admit that, we had several conversations in which she would not agree with me and she would bring her point of view, but whenever she did that I would actually go into a polarity experience where I would get angry, spite that I would never tell to her about it or didn´t even argue around her point, what I would do, is that I would actually push myself to reconsider my whole vision and starting point with regards to that particular subject, just to get aligned with her and within that, be able to remain with her as much as possible, because I wanted to keep that point where I was getting my acceptance and positive experience around myself. Very recently, I had a session of Kinesiology and this session actually help me to bring quite a lot of the mind pattern that I created in relation to this girl, and why it has been so difficult for me to be able to move on and through this relationship towards this girl. "ok so what tested out for you to have a look at is how you have a personality of being very 'moralistic, specific morals tested out as being for instance: No boasting, Treat others as you would want to be treated, Be forgiving, No cheating (in general), Be dependable, Respect others. So within this personality, you tend to go into a 'character' (which is like a momentary personality expression based on an experience) of feeling 'disgusted, sarcastic and critical' whenever you see people whom you perceive are not living according to those morals and here specifically a co-worker is testing out as someone you might be experiencing this in relation to more recently. So when you're dealing with morals in the mind, it's actually based on a fear." I would continue with more in the next post. Thanks for reading. As I was listening to this interview made by Matti Freeman, an amazing thing came across within my personal experiences which was that, I just began to remember how much I actually enjoy to do physical work... by physical work I don´t mean lifting weights or something (Well of course that is also something fun, lol) but I mean, everytime that I had the opportunity to do any kind of "heavy task" (and this since I was a kid) I would go and try to help the people with that, for instance when my parents wanted to hire a bricklayer to repair something, I would go and help the bricklayer because I knew that they would require to do something like breaking a wall or things like that, and I got so much fun of just being able to use the mallet and hit the wall until I was able to break the damn thing LOL!!! Or whenever I saw someone making a little task (and this is part of why I was constantly criticized on the school) I would go and try to help, because whenever I was doing little tasks here and there, that would also give me an amazing opportunity to be able to get out of my mind for a moment and I was able to just focus on the moment that was taking place right in front of me. So, what I will try to do, is that whenever I see that I get stressed out or something when I am doing like any kind of mental labor, I will give myself a chance to look out for any little task around my house (and at the same time it will be a nice opportunity to help in my house) to be able to assist and support myself in finding that space for me to be able to breathe and focus on a task that doesn´t require me to overthink on it, but just do it in the simplicity of it´s requirements. Mi Jornada hacia la Vida, Día 1014, Attraction. As I was listening to this interview, I began to bring the exercise into the particular pattern that I have been following in relation to the kind of "partners" that I have been looking at, and I noticed several points like: talent, intelligence, fun, beauty, softness, strength. Then, as the exercise propose, what I am going to do now is to look at how is it that I am living this words within myself to be able to identify and possibly remove whatever energetic movement exists within myself. In relation to the word "talent", I can notice that I always tend to look out for the approval of the people around me whenever I draw, write or do anything that I regard as "artistic", and when I meet this girl that I have been dating for a while, for me it was like very important that moment in which she looked at my work and said "wow, you are very talented", but for me, whenever I am writing or drawing or anything like that, it feels as if I were not able to totally appreciate what I do, which I have always believed that is part of "the process of the artist" (or something like that, lol), but only with this word I can already notice this principle that it´s mentioned in the video of Supplementarity, in which I have tried to find a partner that likes "feel the acceptance for my work that I am not able to feel" LOL!! Just as I am writing this, something has come to the eye, which is something that is constantly repeated all around this process, like whenever one says "When you are looking for this, or that in this person, you are actually looking for yourself, or you are looking at your self", which is actually something that I must admit that I didn´t quite grasped until this moment, because every time I heard a person say "You must first accept you to be able to walk with another", what I would consider is that I had to like "accept my failures, limitations, and so on" and be comfortable with them, lol, which is actually something quite deceptive, because it´s like not having to keep working on myself to actually improve myself. And whenever it came to that point of really trying to get close to someone, what I was also told to do is that I should only "show the best of me", but I will not dare to bring up those "negative points" because I was too afraid of then not "being enough" for the person, who will end up "not accepting me" lol, then what I concluded is that I have to look for someone who is able to like "feel that acceptance in my place, or feel the acceptance that I wasn´t able to feel by myself, or feel accepted by me, LOL!!!!" El día de ayer realicé un pequeño examen de evaluación para poder conocer mi nivel de inglés, quedé con un nivel bastante cool aunque no puedo hablar de un 100%. Esto es algo a lo que, más consciente que inconscientemente, me he resistido a hacer, no obstante, es de igualmente modo parte de un proceso que consideró sumamente importante llevar a cabo y realizar en diversos sentidos, sobretodo porque el mundo laboral así lo demanda. Voy a darme a la tarea de aprender un nuevo idioma, además del inglés, ya revise los costos y las escuelas en las que podré haberlo, espero de hecho hoy mismo poder ir a terminar el registro del idioma inglés para comenzar con las clases de francés en la escuela. Así que, lo que me gustaría caminar aquí, es la aplicación de perdón a uno mismo, así como la aplicación correctiva y mi declaración de compromisos para llevar este proyecto a cabo hasta sus últimas consecuencias. Me perdono a mí mismo por haberme aceptado y permitido a mí mismo resistirme a aprender un nuevo idioma, al pensar que con el inglés tenía suficiente y hacia el cual de hecho no he concluido del todo mi resistencia de igual manera para llegar a dominarlo lo más posible. Me perdono a mí mismo por no haberme aceptado y permitido a mí mismo darme cuenta y reconocer que cuando llegaba a proyectar juicios hacia las personas que presumían de conocer un segundo idioma, porque pronunciaban cosas frente a los demás a pesar de que no les entendíamos nada y tenían que volver a decir todo lo que habían dicho para que pudiéramos entenderlos, en lugar de generar más resistencias hacia aprender un nuevo idioma, por el contrario, tendría que haberme empujado a mí mismo para de hecho ir a aprender por mí mismo otro idioma. Me perdono a mi mismo por haberme aceptado y permitido a mi mismo haberme resistido a aprender francés, al pensar que en realidad aprender un nuevo idioma ya se trataba únicamente del ego y el orgullo de quienes querían presumir que conocían otro idioma, no obstante, ahora veo y me doy cuenta que en realidad es completamente por el contrario, porque tener un segundo idioma abre las puertas en muchos lugares para trabajar. Me comprometo conmigo mismo a llevarme a aprender y practicar un tercer idioma hasta llegar a dominarlo. Yesterday I wanted to commit more than a few hours to my assignment on the DIP, as I want to assist and support myself in moving as fast and effective as possible out of a pattern that has been taking place within my mind very recently and it has gotten to such an extent that it even took away my sleep for more than a few hours. I got some difficulties in migrating to one language to another, as I have already also changed from buddy in my DIP and now I am pushing myself to actually get more comfortable by writing on English, and specially being able to get comfortable in the sense of being able to be intimate with myself - Into - Me - I - See. I forgive myself that I have accepted and allowed myself to think or believe that I am not able to be as comfortable as I am by writing my self forgiveness on Spanish, when actually, all that I need to do is find the way to express myself in the way that I can actually like "portray" the same resources that I can take from the tools of the Self-Honesty, Self-Forgiveness, etc., to be able to walk through it in whatever place I find myself. ¿No te ha pasado alguna vez que tienes la sensación de haber abordado suficientes conocimientos como para haber llegado a ese punto en el que eres capaz de desarrollar una solución de forma práctica, pero debido a que el conocimiento que tienes parece tan separado, parece y se "siente" tan efímero y teórico, que únicamente y a partir de los estudios hechos por tal grupo de científicos, en cuyos métodos y observaciones debemos depositar nuestra confianza por completo, es cómo puedes respaldar y dar vida a tu supuesto argumento, el cual a la vez parece que sólo puedes hablar desde la seguridad de lo que tu mente conoce, pero no tienes prueba real o evidencia física empírica que respalde tus supuestas conclusiones? Este video lo subí el día de ayer, pero lo realicé el día sábado en el transcurso de la madrugada, tras haber reflexionado un poco sobre la forma en que "vivimos las palabras"; no es que pretenda ahora decir que tengo un "conocimiento más grande o más profundo" de lo que significa vivir las palabras, simplemente en medio de la reflexión, me atreví a pensar en las palabras de un modo en el que no lo había hecho antes, porque precisamente me encontraba convencido de que el único respaldo válido de cualquier probable argumento debe de estar respaldado por alguien cuya palabra "valga más que la mía" o "se encuentre certificado para decir y opinar al respecto de cualquier cosa". No obstante, ¿qué pasaría si realmente decidiéramos vivir las palabras que hablamos? Es decir, digamos que tenemos la suficiente curiosidad y entendimiento de lo que implica un proceso evolutivo, o al menos alguna noción básica que despierta aquel interés y curiosidad que nos hace preguntarnos por más, ¿Por qué si tenemos ese conocimiento, no tratamos de entendernos como aquello de lo que estamos hablando y ya sabes, ponemos a prueba lo que estamos viviendo y lo que queremos vivir dentro de esa palabra? Imagínate esto por un momento: Allí te encuentras realizando el mantenimiento general de tu hogar y de pronto sientes curiosidad por realizar alguna pintura en el muro de la pared de tu cuarto que viste o te llamo la atención de alguna red social, así que compras un par de botes adicionales para llevar a cabo el proyecto que deseas ver y realizar en tu propia habitación, el primero no sale bien, pero realizas un segundo, un tercero y un cuarto hasta que comienza a parecerse a la idea que tenías en mente. ¿Si nos entendemos como ese potencial de evolución y como la capacidad misma de ser aquella oruga que se convierte en mariposa, por qué no nos lo creemos? ¿Por qué preferimos esperar a que las cosas nos ocurran en lugar de hacer que nos ocurran las cosas? Es como dicen, ¿Por qué no nos decimos lo que no nos hemos dicho para ver si nos pasa lo que no nos ha pasado? Eso es lo que encontré, resulta ser el punto clave de vivir las palabras, no se trata de lo que sabes, porque podemos partir de absolutamente nada, bueno, no específicamente de absolutamente nada (tienes que basarte en algo...), pero ya sabes, puede ser algo no necesariamente comprobado ¿sabes? Se trata de la confianza en ti mismo, se trata de creer en tu propio proceso y en cierto modo tener FE en ti mismo, y tener la humildad para admitir el error en caso de estar equivocado, para entonces corregir el rumbo y comenzar el proceso necesario que nos lleve al punto que pretendemos. ¿Qué clase de seres humanos queremos y nos atrevemos a ser? ¿Qué clase de mundo queremos ver y vamos a crear a partir de nuestras observaciones, lo cual por supuesto, no deben quedarse únicamente en la observación, sino en lo que llevaremos prácticamente a cabo para poder crear aquello que pretendemos ver de nosotros mismos? Esto es lo que personalmente me llevó a experimentar aquella decepción de mí mismo, de la humanidad, porque fue como ese momento de ya sabes, darte cuenta de que aquello que sabes, aquello que crees conocer, sólo está sentado en mi mente como esperando ser comunicado y hablado, pero ese conocimiento se "siente" como si no fuera YO, como si no fuera algo que estoy viviendo a tal grado que no simplemente lo sé, sino que lo pongo a prueba, lo pongo en práctica y trato de descubrir e indagar más para que, al momento de vivirlo, pueda saberme precisamente ese ser cuya capacidad evolutiva, cuya capacidad de cambio se ve definida por acciones especificas que se repiten y se llevan a prueba una y otra vez, tal y como lo hace cualquiera de los seres vivos en nuestro entorno (en especial si sientes alguna fascinación por los insectos, te recomiendo que los observes más detenidamente y cómo una acción especifica los lleva a desarrollar alas o desarrollar piernas especializadas para brincar, etc.) Sólo digo que el verdadero poder del conocimiento e información, sólo se encuentra por medio de la "confianza en uno mismo", y no puedes confiar en algo que no has vivido y comprobado por ti mismo, de lo contrario, cualquier "profeta" que haya tomado alguna suerte de curso en debates o procesos discursivos, o incluso cualquier persona en un bar que tenga un ápice de confianza más afianzado que el propio, se dará el lujo de "cambiar tu opinión a la suya una y otra vez", hasta que finalmente dudes de conocer cualquier cosa y comiences a depositar tu confianza en las experiencias y argumentos ajenos. El día anterior compartí que realizaría un viaje a casa de mi abuela junto con unos amigos, y compartí un poco acerca de lo desafiante que por momentos me resulta el ver algún contratiempo frente al plan que ya había desarrollado con anterioridad. Pues durante este viaje, me permití que las cosas simplemente fluyeran un poco más y, en efecto, resultó ser un gran viaje, lol. No entraré en detalles, pero definitivamente hubo más de un par de momentos donde las situaciones me resultaban sumamente desafiantes, puesto que en este viaje que había planeado con esta persona, había de igual manera planeado que, ya sabes, “fueran únicamente con esa persona”, pero la verdad es que conforme cada momento iba ocurriendo, me daba cuenta de que ciertamente no todo estaba tan mal y, ya sabes, todos terminamos pasando un buen rato juntos. El secreto residió en simplemente ir dejando que las cosas cayeran en su lugar, e irme moviendo con la corriente como dicen, por momentos si me vi en la necesidad de aplicar alguna declaración de perdón a uno mismo para silenciar cualquier comentario de mi mente, ya sabes, de esos comentarios insidiosos que podemos llegar a tener, donde la mente resulta mucho más desagradable que de costumbre y, en cierto modo, el ir aceptando que las cosas son de la forma en que son a cada momento y que la única diferencia que puedo hacer reside única y exclusivamente en la injerencia que tengo sobre mí mismo y sobre mis propias acciones, mis propias palabras, mis propios pensamientos, resultó ser la clave para “abrazar el momento”, aceptar a las personas que formaban parte de ese momento y aceptarme a mí mismo en el momento que estaba viviendo, lo cual ciertamente no es algo simple de vivir y realizar. En cierto modo, dejé de pelearme con mi mente tratando de obtener un determinado resultado, aplicando en la palabra “resignación” combinada con un poco de “humildad”, el término de esa competencia contra el momento, ya sabes, como cuando tratas de “ganarle a la vida” manipulando, moviendo y modificando las cosas a la supuesta “conveniencia de uno”, sin tener realmente idea de cómo entre tanta manipulación que uno aplica, nos perdemos a nosotros mismos el potencial de la mejor versión que podemos llegar a ser de nosotros mismos en cada momento. Me perdono a mí mismo por haberme aceptado y permitido a mí mismo tener miedo de perder “el control” del momento, dónde en realidad esto no se refiere a otra cosa más que al “control sobre mí mismo”, lo cual es al mismo tiempo el resultado y consecuencia de formarme tal idea y expectativas acerca de mí y de cómo aparentemente deberían “surgir las cosas”, porque es en ese momento dónde cualquier cosa que no “parezca” la imagen que me he formado de mí mismo en mí mente, es como un factor que debo controlar, a pesar de que ese factor se tiende a proyectar en otras personas en lugar de darme cuenta y entender que simplemente todo deriva de la confianza en mí mismo y del punto de partida que decido vivir con respecto a otras personas. Me perdono a mí mismo por no haberme aceptado y permitido a mí mismo darme cuenta y reconocer que ver mi "ego herido" porque las cosas no salieron como yo quería que salieran, sólo pone en evidencia el grado de manipulación y abuso que he querido ejercer sobre otras personas para mi propio beneficio, lejos de realmente construir vínculos de apoyo que puedan hacernos crecer y mejorar mutuamente. Me perdono a mí mismo por haberme aceptado y permitido a mí mismo creer que todas las cosas deberían salir como yo quiero que salgan, y si ocurren de esa forma entonces puedo estar feliz porque todo ocurrió como "debe de ser", en lugar de darme cuenta de que en cada momento, en cada situación existe un regalo, existe una forma de proceder, existe una ventana de oportunidad para traer y brindar lo mejor de mí mismo. En y cuando me vea a mí mismo buscando ejercer control ante una situación, respiro y observo en honestidad conmigo mismo "¿Qué es lo que intento controlar de esta situación y cómo es que busco mi interés personal a través de ello en lugar de buscar lo que sería lo mejor para todos? ", perdono lo necesario y re-defino mi punto de partida hacia esa situación que emerja. Me comprometo conmigo mismo a fluir en cada situación valiéndome de las herramientas de la honestidad conmigo mismo, el perdón a uno mismo, el respiro de vida, el sentido común, la aplicación correctiva y la declaración de compromisos en cada momento. Hablando un poco de flexibilidad en el horario, precisamente el día de hoy saldré a visitar a mi abuela y no podré publicar mi próxima publicación el día de mañana a la hora que asigné en el horario, aunque claro, eso no significa que no la escribiré en el momento que corresponde y la publicaré en la primera oportunidad por este medio, pero en fin... dejando de lado por un momento esas nimiedades, quería escribir un poco de los acontecimientos del día de ayer, sobre todo en relación con el punto de cuando los planes cambian en el último momento, tal y cómo describía Joe Kou en una entrevista reciente que realizó con Sunette. Hace dos semanas que planeo esta salida con mi abuela junto con un amigo, pero justo el día de ayer surgió uno de esos momentos que cambian la forma en que llevaríamos a cabo nuestros planes en el último minuto, y es decir, no fue gran cosa, simplemente se añadió una persona a nuestro viaje que no tenía en cuenta, y debo de admitir que eso me molestó, pero invariablemente de ello, conforme lo consideré un poco más, me di cuenta de que en realidad no estaba tan mal y que en realidad podía seguir divirtiéndome sin importar si otra persona se encontraba presente o no. Me perdono a mí mismo por haberme aceptado y permitido a mí mismo sentirme molesto por ver los planes que tenía hechos de un minuto a otro ser frustrados por una persona externa, sin darme cuenta que en realidad los planes no tienen por qué frustrarse, ni tienen porque cambiar radicalmente sólo por la presencia de otra persona, es decir, al final rara vez las cosas pueden ejecutarse al margen de lo que planeo y el cómo las planeo, pero no por eso el resultado es del todo malo, desagradable o significa que no puedo aún disfrutar un agradable momento y pasármela bien. Me perdono a mí mismo por haberme aceptado y permitido a mí mismo tener miedo de soltar el control y dejar ir los planes para darme la oportunidad de conocerme a mí mismo en cara de las eventualidades y dentro de ello sacar lo mejor de mí en cada momento, en cada instante, sin importar cómo resulten las cosas al final del día. Me perdono a mí mismo por haberme aceptado y permitido a mí mismo vincular una experiencia energética negativa a las eventualidades en lugar de permitirme darme cuenta que no existe un plan que salga a la perfección, ni existe control absoluto sobre ninguna situación, para que de este modo pueda darme la oportunidad de "fluir" con el momento como dicen, y sacar lo mejor de mí en cada uno de éstos. En y cuando me vea a mí mismo entrando en una experiencia energética emocional cuando sea que vea un cambio de planes de último minuto, respiro y dejo ir el control que he querido ejercer sobre una determinada situación para darme la oportunidad de ver qué regalos o qué puedo tomar de la experiencia que se encuentra frente a mí en un determinado momento. Me comprometo conmigo mismo a disfrutar de las eventualidades tomando lo mejor de cada una y divirtiéndome en el proceso. 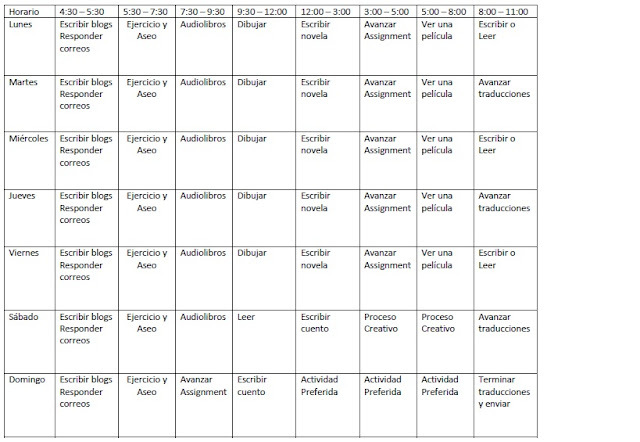 El día de hoy voy a comenzar con un nuevo horario que acabo de terminar hace unos minutos, el cual suspendí anteriormente debido a que las actividades de la escuela así lo requirieron y en más de una ocasión me vi obligado a moverme con la marea por así decirlo, pero hoy quiero retomarlo, no para volver a una personalidad "disciplinada o estricta conmigo mismo", sino para darme una guía de las actividades que debo realizar en el día, y aún más las responsabilidades que no pueden escapar a mi consideración. Por supuesto no significa que deje de ser flexible conmigo mismo, como podrán notar, no añadí horas de comida lol, eso se debe a que siempre he sido una persona sin un horario fijo para comer, a veces la tarea es tan divertida o tan absorbente que se me olvida que tengo hambre LOL. 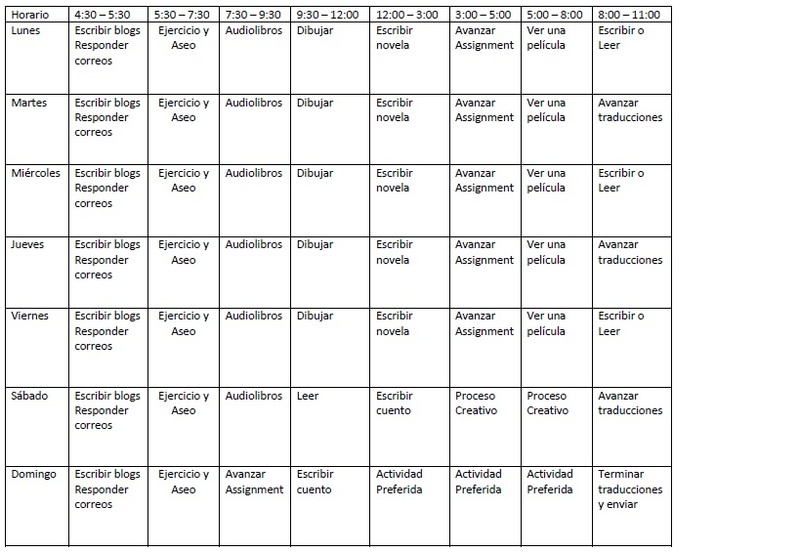 Por lo pronto, he decidido crear este horario como una base, que por supuesto iré ajustando según las actividades lo vayan demandando y ésto por supuesto en lo que consigo un empleo... hablando de eso, voy a apurarme con la siguiente hora, que corresponde precisamente a la de continuar con la nueva novela que tengo en puerta, ya la estaré publicando en mi blog "ARTINSOMNIUM" por si aún no lo conocen. Aún no he decidido si publicaré un capítulo a la vez o toda la novela de golpe, pero creo que por las necesidades de la modernidad, lo haré un capítulo a la vez para poder dar pauta a que cada uno se tome el tiempo de leerlo a su consideración. Esto es todo por el momento, gracias por leerme. En este proceso que he estado viviendo al salir de la escuela, se han vuelto más presentes los comentarios que estuve recibiendo de un sin número de personas acerca de la urgencia que tenía por concluir la carrera, ya sabes, esos comentarios de: "Vas a extrañar la carrera" "Vas a extrañar la escuela"
Y no obstante, a pesar de esos comentarios que recibía de las personas, creo que en realidad todo gira en torno al punto que estuve compartiendo hace un par de días, lo cual es "el temor a tomar responsabilidad de mi propia vida", porque ante más lo veo y más trato de hacer sentido de esos comentarios, lo único que puedo ver es como esa necesidad en apariencia "inherente" a tener como ese margen de error donde todavía puedes literalmente "cagarla" en algún trabajo o simplemente dejar que "no te importe tanto", porque sólo se trata de tu calificación. Pero sinceramente no me parece adecuado pensar el trabajo como ese momento en el cual ya no tienes la "pauta o permiso" de cometer errores, porque no creo que deje de equivocarme y no creo que mi ingreso en la vida laboral vaya tampoco a ser sencilla, como de hecho lo he vivido al ingresar en cualquier área o mundo laboral, pero bien dicen por ahí que el que jamás cometió un error, es porque jamás hizo nada de su vida, y eso es algo que en definitiva no puedo darme el lujo de permitirme. Me perdono a mí mismo por haberme aceptado y permitido a mí mismo dejarme llevar por los comentarios de las personas en mi entorno, generando temor en torno a lo que decían acerca de que: "Vas a extrañar la escuela, vas a extrañar no tener responsabilidades, vas a extrañar tener como única preocupación el hecho de estudiar", sin darme cuenta que en realidad, todo depende de como me doy a mí mismo la oportunidad de asumir responsabilidades, independientemente de la naturaleza de las responsabilidades que lleve sobre mis hombros por así decirlo, porque al final yo determino cuál será la experiencia que yo genere dentro y a partir de mi ingreso completo en el mundo laboral. En y cuando me vea a mí mismo experimentando temor de "depender de mí mismo", respiro y me llevo de vuelta al entendimiento de que sin importar cuál sea la experiencia en el mundo laboral, puedo retirar la carga emocional del momento, porque el temor es simplemente innecesario al momento de salir a buscar trabajo, voy a apoyar de las herramientas que he aprendido a emplear durante este tiempo y a aplicar los conocimientos que he tenido la oportunidad de desarrollar durante este proceso en la licenciatura. Me comprometo conmigo mismo a continuar mi proceso de aprendizaje en el área laboral, sin temor a cometer errores, extendiendo el compromiso conmigo mismo a aprender de ellos cuando sea que los cometa, para continuar mi proceso de perfeccionamiento en el área que me desempeñe. Hace unos cuantos meses parecía casi imposible que dejara un sólo día pendiente sin una publicación, y el día de hoy, parece que hago hasta lo imposible para huir de este momento conmigo mismo. Escribirme en honestidad conmigo mismo se ha convertido casi en una lucha interna en estos días, que incluso, en la privacidad de mi libreta personal, empiezo a dejar las cosas flotando, y digo "flotando" en el sentido de que lo que escribo se siente, ya sabes, "infiel" a mis palabras, a la honestidad conmigo mismo que antes habría considerado casi una suerte de "habilidad amalgamada" en todo cuanto me dedicaba a escribir. Pero ya sabes, creo que precisamente el punto que rehuyo es el punto del que más necesito, porque no es secreto lo mucho que me he esforzado por publicar por aquí toda y cualquier fuente de información que parezca "interesante", "útil" o cualquiera de esas cosas, pero al final creo que en realidad añoro que este blog vuelva a ser un sitio de las palabras que estoy escribiendo ahora, palabras íntimas, en las que simplemente no tengo que proyectar nada, no quiero decir nada excepto ésto, lo que estoy viviendo, lo que realmente está ocurriendo en mi vida. Y es decir, por supuesto lo que ocurre en nuestro entorno y nos afecta directa o indirectamente, son cosas que también nos acontecen, pero una cosa es simplemente estar vomitando conocimiento e información de cualquier cosa para... parecer cualquier cosa, y así apartar la mirada de nosotros y las cosas que tememos ver y enfrentar de nosotros, y otra muy distinta es saber qué, cómo, por qué nos afecta algún suceso o acontecimiento en el mundo, como cuando uno observa a las imágenes de alguna guerra distante y se pregunta ¿Eso soy yo? ¿Es eso en verdad todo lo que soy y lo que puedo ser como parte de la humanidad? Al diablo con esta fachada del intelectual, ya estoy harto, si encuentro algo digno de compartir o hacer audiolibro lo haré, pero ya no más por ese estúpido afán de ser visto como dios sabe qué. Mi Jornada hacia la Vida, Día 1005, Going out to the labor world. Well... I have officially ended up my studies to finally go out and make myself a path through the labor worldo to maintain myself; I must admit that this is a point that I was in a way resisting of looking at, because now what also comes with this, is the very fact of having to look out for myself and depend of myself essentially. Just a few minutes ago, I was talking about this with my buddy from the DIP, and what was mentioned in the discussion was that actually, spite the fact that I moving to do and create more works so that I am able to assemble a nice CV and a cool Workbook to present myself in different places to apply for a job, is that I must watch and face at any point that may come up in relation to this because, at least personally, it happens to me that in the hurry and worry of the pressure that I feel from and around this points, what I tend to do is that as I know that I have to take several decisions, what I also do within and from the energetic emotional experience is that I tend to take the wrong decisions just because I making them out of the experience of hurry, worry, judgment of myself, etc. It´s something weird I must say, because I have already went through a whole amount of different jobs and labor areas, but the difference within this, is that in all of those moments I did had a backup from my family, which now I cannot depend on, and I can also notice the presence of this fear of not fulfilling the expectations of my family, or at least that I have assumed that my family have over me, as well as the picture that I have wanted to project onto my schoolmates, because "What are they going to think of me if I don´t end up having a great job or earning a lot of money?" That´s why I wanted to bring this points here today, to work through them applying self forgiveness and my self commitment statements, to assist and support myself to walk through whatever and all points that may emerge in this process. I forgive myself that I have accepted and allowed myself to be afraid of going out to the labor world and essentially look out for myself, as I have perceived myself unable of taking care of me and look out for me and essentially depend of me, because I have created this definition of myself being: "less than others, or not as competent as others to develop or do what others are already doing and creating"
I forgive myself that I have accepted and allowed myself to compare myself with other schoolmates who are already in the labor world and that are already earning their own money, because of this judgments that I have accepted from my mother whenever she has said to me that "She see´s to the sons of her friends and how they are proving to be successful people while I was still in the process of ending up my career. I forgive myself that I have accepted and allowed myself to define myself accordingly to the words of my mother, instead of trusting in my own abilities and capacities to move myself and look out for a job so that I can provide for myself and hopefully, earn enough to not only provide for myself, but also others in some future.